Next Event Date Coming Soon! See event full SCHEDULE below for details and ticket information. Shop this all season sales event to find the best in children and maternity at 50%-90% off retail! 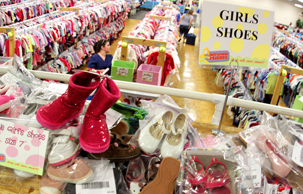 • clothing • shoes • coats • toys • books • games • baby gear • strollers • swings • playsets • nursery items • kid's furniture • room decor • & so much more! We accept cash and credit cards including, Visa, Mastercard, Discover and Amex. Sorry, no checks or money orders. No kids, strollers or wagons aside from infants carried by you or in a sling/carrier allowed at Presale. Kids & Strollers are Welcome today. **This is no joke, take an extra 50% off any item without a star on the tag! Kids & Strollers are Welcome today! QUALITY: No digging for gold, we only accept the best quality items! SAFETY: Our certified recall specialists ensures each item meets the latest consumer safety guidelines. ENVIRONMENT: JBF Austin North has a strong commitment to preserving our environment and protecting our landfills. By shopping gently used items at JBF, you are saving thousands of items from pointlessly hitting our landfills. COMMUNITY: Over 170 families consign with JBF, so the items you purchase, directly impact the profit to our Austin and Pflugerville Community. The only entrance to the park is on the service road of TX-130 South, just south of the intersection of HWY 45 & TX - 130. Parking is FREE. *The entrance on HWY 685 is NOT accessible and will not be open do to fire regulations. Sorry for the inconvenience! If you see the water slides, you've found us! Don't miss out! Sign up so we can keep you in the loop on our next sales events! Everything the owners are great and always willing to help. Everything!! Fun & Happy People a great way to clean up and make money! !